It really doesn’t take a lot to make a guy from Philly happy at lunchtime. Send him to a clean and basic restaurant that does a tasty hoagie or a nice cheesesteak and he’ll be smiling ’till dinnertime. As any Philly boy or girl can tell you, a sandwich like this is good for the soul. The concept of a great hoagie is pretty straightforward. Take a freshly baked Italian-style roll, line it with freshly sliced meats and cheeses, and fill it with lettuce, tomato, onion and condiments. Sprinkle the whole with herbs and oil and you’ve got a real fistful of sandwich. Sounds simple, I know. But somehow or another, the farther you get from Philadelphia, the sandwich and the whole experience goes a bit wonky. The first thing to go under the wheels is the name. Even after many years in Seattle, I miss the sandwich culture that the Philadelphia area fosters so well. Every time I go back for a visit, I wallow in it. You can find me most days relishing a good hoagie or the occasional decadent cheesesteak at some local hangout. Call it my connection the past. Here are two places that still make great sandwiches the way I remember them, and a new center city sandwich joint that promises to set the tone for the 21st century. 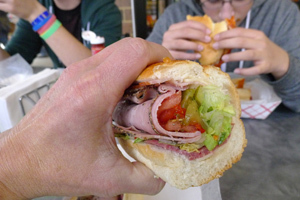 A sub at Capriotti's in Hockessin, Delaware. In Philly, this same sandwich would be called a hoagie. For the best cheesesteaks and hoagies in Montgomery County, go to Pudge’s. 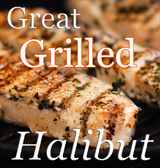 Only a short drive from Plymouth Meeting, where the Blue Route, The Pennsylvania Turnpike and the Northeast Extension collide, this is a the perfect place to take a break and get a great lunch. My craving for a Pudge’s hoagie takes us here on every one of our visits back east. The cheesesteaks are to die for. The staff is friendly and efficient. And while Pudge’s has recently moved into bigger digs in the next shopping center down the street, I’m pleased to say it hasn’t changed their quality one bit. 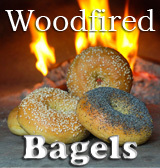 Pudge’s sandwiches are built atop rolls fresh from the Conshohocken Bakery, which are cut nearly in half and laid open like books. 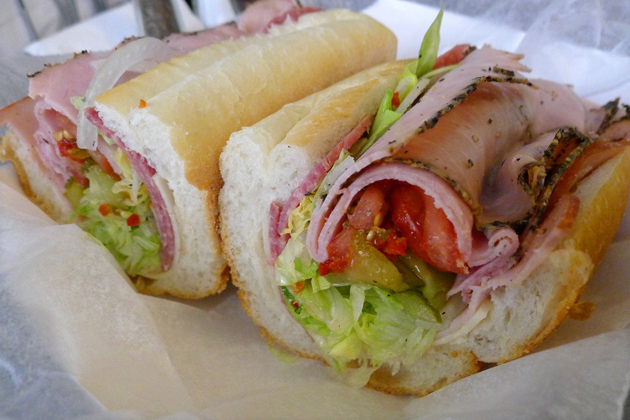 Hoagies are lined with prime deli meats and then heaped with lettuce, onion, peppers and tomato. Pudge’s famous steak sandwiches – in regular or the ginormous 20” size – are piled with lean and tasty grilled beef and topped with provolone cheese and sautéed onions. 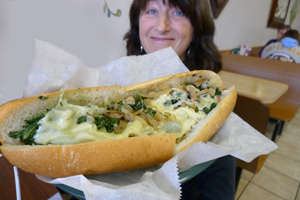 Vegetarian sandwich choices include an eggplant parmesan sandwich, cheese hoagie or their mean and green spinach sub. Bite into any of these and you’ll think you’ve gone to sandwich heaven. It always blows me away that, for the amount of food Pudge’s gives you, their prices are so reasonable. For about $7 you can get a variety of regular subs that could easily feed two in a pinch (naah, never happens!). For that cost, and with high quality to boot, I’d call Pudge’s a real bargain. Something about Capriotti’s keeps me coming back for more. Sure, the pickles on their Delaware Subs are a little different for a Philly boy and add a certain zing, but it’s more than that. At Capriotti’s, you always feel you’re in eminently capable hands, hands that make some of the best sandwiches in America. Now I have a confession to make. I’ve been going to this little sandwich shop near Hockessin for years in blissful ignorance of the fact that Capriotti’s is part of a chain. Hey, I’m not from Delaware; how would I know? Except for the logo on the sign, there’s nothing ‘chainlike’ about the place. And really, it doesn’t matter, because they make a fantastic sandwich every time. Capriotti’s has earned a kind of cult following for the ‘Bobbie’, their signature sandwich made with house roasted turkey, cranberry sauce and stuffing. A little unusual, certainly, and I might have tried it if we hadn’t been noshing there on the day after Thanksgiving. Oh, well, I’ll just have to go back. Again. 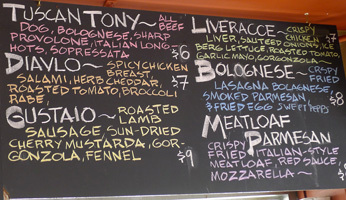 Every neighborhood should have an innovative sandwich shop the likes of Paesano’s. Located a few blocks south of South Street in Philadelphia’s little Italy, Paesano’s takes the whole concept of an Italian sandwich and turns it on its ear. Sure, you can get a real Italian hoagie, but you’re more likely to be dining on a sandwich filled with fried lasagna, roast suckling pig, or chick pea pancake. Peter McAndrew of Modo Mio Trattoria on Girard Avenue opened this place in February, 2010. It’s casual and friendly, but that’s not why people come here. They come for the flavors. Think fried meatloaf parmesan with sweet peppers; beef brisket with roasted tomatoes, provolone and egg; or house-made lamb sausage with fennel and arugula. Or go out on a culinary limb for McAndrew’s pièce de résistance – the Arista, made with suckling pig, hot Italian sausage and broccoli rabe. Paesano’s keeps the non-meat eaters happy as well with a Sicilian chickpea pancake wrap and a roasted eggplant sandwich that features caramelized veggies and pesto. Mm, mnnn. Paesano’s is ideally located at the north end of the Italian Market, right across from Lorenzo’s. Stroll around the neighborhood market. Forage for your Italian delicacies in the specialty shops that line Ninth Street. And then go have lunch at Paesano’s. You’ll be so glad you did! A note on nomenclature: All of these sandwiches are called ‘subs’, named for the shape of the roll. A ‘submarine sandwich’ to the old folks. In Philadelphia, a cold sandwich made in a sub roll with deli meats is called a ‘hoagie’. A ‘cheese steak’, made with finely shaved beef fried on a griddle and served hot with melted provolone or other cheese, is technically a ‘cheese steak sub’, but you’ll rarely see that term. With or without cheese, it can also be called a ‘steak sandwich’. Some places call a heated sandwich a ‘grinder’, a term usually reserved for a cold deli sandwich that’s been put into the oven. 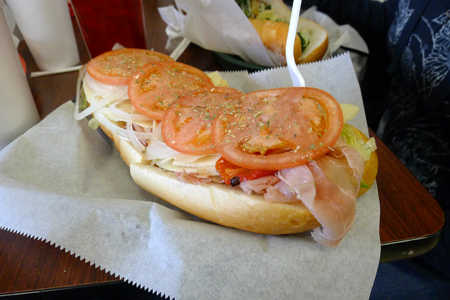 In Norristown, a slight variation on a hoagie is the ‘zep’. Now my mouth is drooling and stomach is grumbling for home…I know Pudge’s very well as with Capriotti’s. Thankfully Capriotti’s is here in Vegas (go figure)and is just like the ones in DE. The Bobbie and Capistrami are THE Best sandwiches in the Vegas area. But I do still miss the others. Time to get my Philly Grub on…Great post!! You already know how much I love this post, but I’d thought I’d say it again. I love this post! Fried meatloaf! Genius. We always eat cold meatloaf sandwiches with ketchup, on Sunbeam bread, but I may have to veer off the meatloaf path. Great post!! I am a huge sandwich lover, you just gave me some great ideas! A Philly boy, huh? I knew I liked you. As a Philly girl I often get a craving for a great Cheesesteak or a hoagie and they don’t exist anywhere but there (no good ones, anyway!). I have had knock offs of the true hoagie but never the real thing as far as I know. Give me a Philli Cheesesteak sandwich but I guess that is a whole other animal? Nothing beats a Philly hoagie! I’ll have to try the shop in the Italian market next time im up there. I’m really curious about what is in a Spinach Hoagie. Yep, Pudge’s is the best but every time I go back, the folks that eat there all the time tell me it has changed a bit since the original owner passed away. Personally, I can’t tell , I live in Japan and stop at Pudges as soon as I hit Germantown Pike off the the Blue Route, I head straight to Blue Bell for a cheese steak.